In the early days of television, the 60-second ad unit was the standard. But in the late 1960’s the trend to shorter ad lengths took hold and the proportion of 60-second ads dropped from 100% in 1965 to 21% in 1975 to less than 2% in 1980. Driven by rising media costs, the majority of television ads in the United States have been 30-seconds with well over one-third being 15-seconds or less. In many other countries the ratio of ads under 30-seconds is even greater, with 20-second and 10-second ads being popular. However, longer video ads are staging a dramatic comeback. Look no farther than America’s premiere advertising platform, the Super Bowl. In 2009, 23% of Super Bowl ads were 60-seconds or longer. Fast-forward to 2014 and this percent nearly doubled to 43%. And in annual best ad lists from USA Today, the Wall Street Journal and AdWeek, videos of 60-seconds, 3-minutes and even longer dominated at the expense of the 30-second spot. These lists reveal the true driver of the renaissance in long-form video – online viral video. MSW●ARS research has shown that advertising effectiveness – both CCPersuasion and Related Recall – decrease for shorter ad lengths. However, this is often more than balanced out by the lower cost of the media buy, making shorter lengths a smart play. But with online long-form video, the cost variable can drop out of the equation. An ad can be as long as you want, if you can get consumers to watch it. The prize for doing so is potentially enormous – and growing. In fact, comScore recently reported that online video now reaches 85 million daily viewers in the US alone. While long-form videos are at their heart commercial advertisements in the same way as TV ads, they also fundamentally differ in their delivery mechanism. While television ads to a large extent play to a captive audience, long-form videos must not only hold viewer attention to avoid being clicked away from, they must also convince viewers to share the video with others. To do this, these videos must be highly engaging to their audience. But this is not necessarily a bad thing. Being restricted to a 30-second or even 15-second canvas requires compromise. Larry Dunst once wrote “it’s hard enough to tell a ‘story’ in 60-seconds. It’s very hard in 30. In 15 seconds, forget it!” Long-form’s capacity for effective story-telling has led to the evolution of short films with high production values and top Hollywood talent. An example is the Johnnie Walker video “The Gentleman’s Wager” featuring Jude Law. This video entertains and engages while infusing the product throughout and presenting an aspirational lifestyle meant to resonate with target consumers. Long-form is also ideal for incorporating emotion, as it allows for a gradual build-up of tension and can lead viewers to become involved with the characters in a way not possible in standard ad lengths. 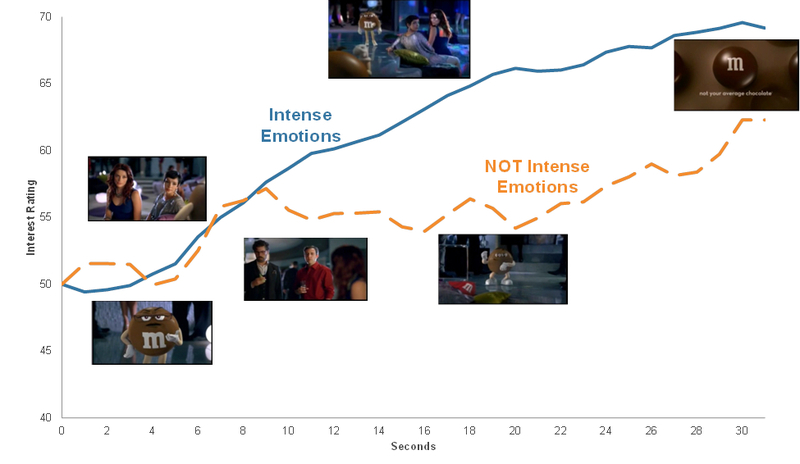 An analysis of acclaimed ads from the 2012 Super Bowl revealed that viewers who did not experience an intense emotional connection disengaged from the ad, as seen by a drop-off in interest relative to those with an intense emotional connection. Such a lack of emotional engagement can be fatal to the prospects of a viral ad. But ensuring viewers don’t click away is not the only advantage of emotional engagement. Ron Lawner once observed that “successful campaigns have two things in common. They have the rational message right. But when they succeed, they also have the emotional message right.” MSW●ARS research backs Lawner’s observation with one study showing that 60% of “liked” ads out-performed their basic selling proposition in terms of sales-effectiveness, while only 7% of “not liked” ads did so. Emotion is the currency of the greeting card industry. Yet in their video “World’s Toughest Job”, cardstore.com was able to powerfully evoke an emotional response in a way that was not only fresh and original but also relevant to the brand’s business. On the other hand, feminine protection advertising is more often defined by a focus on functionality. But in “Like a Girl”, Always sought to associate itself with building girls’ self-esteem at a vulnerable point in their lives in a way that no doubt left a lasting impression on many viewers. 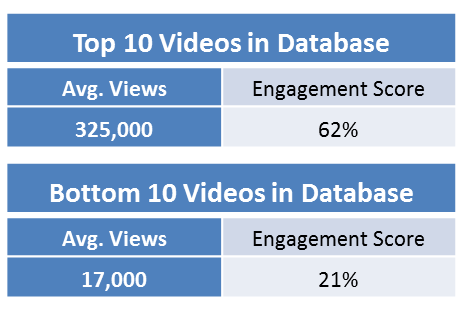 The derived engagement score not only explains between 80% and 90% of the variance in buzz metrics (intent to forward and intent to watch again) but also was indicative of actual views on-line as can be seen in the contrast between the highest and lowest scoring videos tested by MSW●ARS. While the number of potential approaches is as unlimited as the human imagination, a novel idea underlies the most successful viral ads. The idea is so original that viewers want to be associated with it by passing it on to others. Evian hit on such an approach with its Baby & Me spot, which has registered over 92 million views on YouTube to date. While it is apparent that long-form videos are not simply longer versions of hard sell approach televisions ads, ultimately they must be able to help the brand sell to justify their continued relevance in a brand’s media strategy. They must do their part to aid in differentiating the brand in consumers’ hearts and minds. An effective long-form video can do this through building on the emotional connection between consumer and brand, associating the brand with qualities important to its image, revealing the brand’s values and how they promote them, or even showing the brand in action by solving problems in a way that inspires viewers to share. Through its video “The Scarecrow”, Chipotle not only created a visually striking world for its main character to inhabit, it also infused the story with values the brand wished to be associated with, such as respect for animals, whole foods, initiative and hard work, and doing things the right way. To understand whether a long-form video is effectively motivating viewers, MSW●ARS’s Touchpoint Plus platform can be used to assess sales effectiveness. In fact, one long-form video in excess of 4 minutes in length achieved a 99th percentile CCPersuasion result indexed versus benchmark. And given the importance of an emotional connection and effective engagement throughout the length of the video, evaluative techniques based on neuro-scientific research are particular valuable. For example, facial coding or EEG techniques can give a read on emotional engagement that is temporally discriminating to allow assessment of engagement in the critical early seconds of the video and to identify any segments where there is potential for viewer disengagement. Please contact your MSW●ARS representative to learn more about techniques for evaluating long-form video formats.